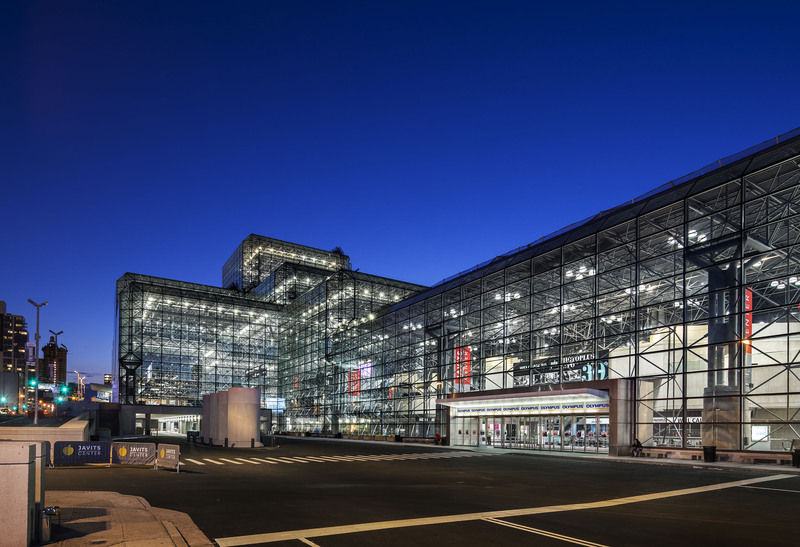 The Jacob K. Javits Convention Center, which first opened in 1986, is located on the west side of Manhattan extending along five blocks of Eleventh Avenue. Heintges worked on this recent renovation of the complex, including a complete replacement of the building envelope and mechanical systems, as well as refurbishment of the existing structure, the building logistics, and the exterior and interior site conditions. 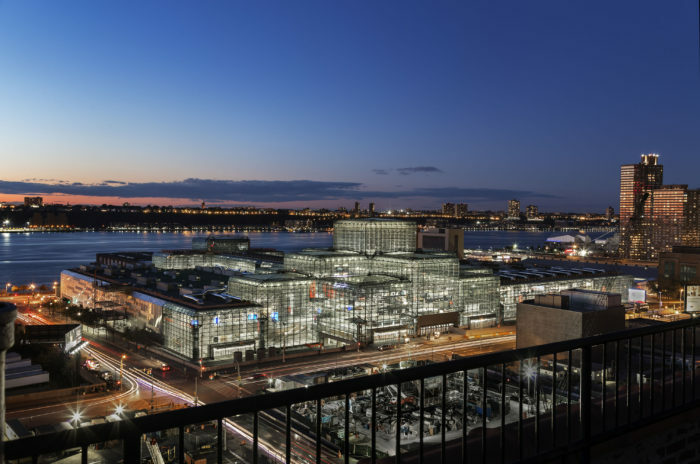 The project entailed complete renewal and replacement of the glass and aluminum enclosure of the buildings. The new vertical-and-sloped facade accommodates the existing structural grid with vision and spandrel modules 5 feet high by 10 feet wide, mounted onto a 10-by-10-foot custom-designed unitized aluminum frame. In addition to the new glass, the simplification of the modules together with newly designed anchorage, provide a lighter look to the facade. 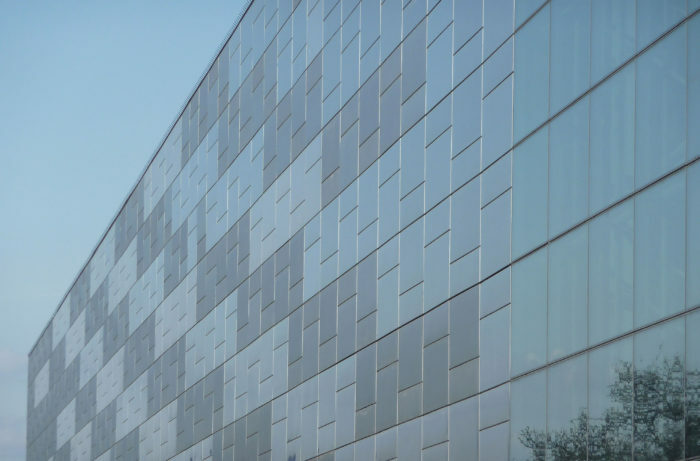 The new curtain wall and skylight systems are glazed with a new high-performance insulated glass with alternating frit densities, to optimize translucency while reducing exterior and interior reflection and glare. The glass is also bird-safe tested. The stainless steel cladding consists of panels with three distinct finishes that can be perceived as having different gloss and reflection levels depending on the standpoint of the viewer and the position of the sun. 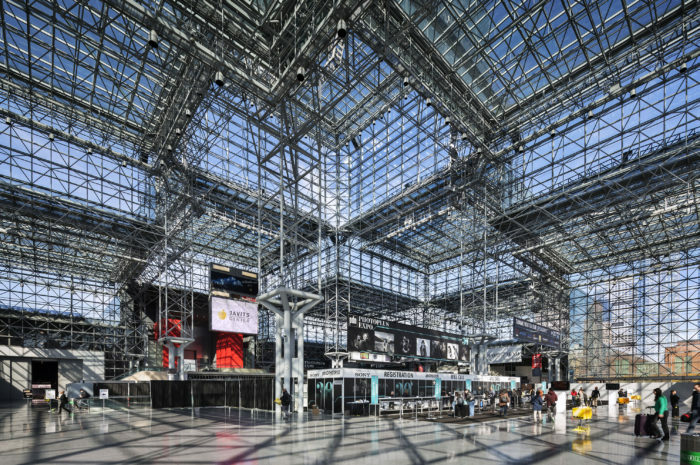 The renovated and expanded Javits Convention Center also has new entrances with canopies of cantilevered glass and vestibules clad in stainless steel. Each cantilevered glass canopy extends from the building’s exterior to its interior, also providing a ceiling over each vestibule. Heintges provided consulting services during all phases of design and construction. The firm was heavily involved in the on-site analysis and testing of the existing conditions, and assisted with the parallel evaluation and development of alternate refurbishment schemes during design. Heintges also provided full inspection services during construction. Photographs 1-3 by David Sundberg/Esto; Photograph 4 by Heintges.